This is an incredible little gem of a fireplace mantel. On very rare occasion, we find cherry wood pieces in a barn. This was one of those great rare times. However, we only found two little short pieces. So, we joined them together with a ‘scarf joint’ just like they did in the old barns. Back in the day, many of the long timber stopped at about 20 feet, but many barns were 60 to 80 feet long. To resolve this, they joined two beams together with scarf joint where the ends of the beams zig-zagged together. There is a little wooden peg pounded in the center that forces the ends the beams into each other. In this case, there is no glue or bolts. Everything is held in place by natural force. Scarf joints are kind of fun because the style varies from barn to barn. When we created this mantel, we literally traced an original scarf joint onto these two cherry beams and then did the cutting. Between the two partial beams that we had, 71 inches was the longest we could come up with, but the end result is a real gem. Cherry is very, very uncommon in the barns around here. One of the other times we found some cherry was in the roof sheathing of an old garage. That was a neat little find as well. 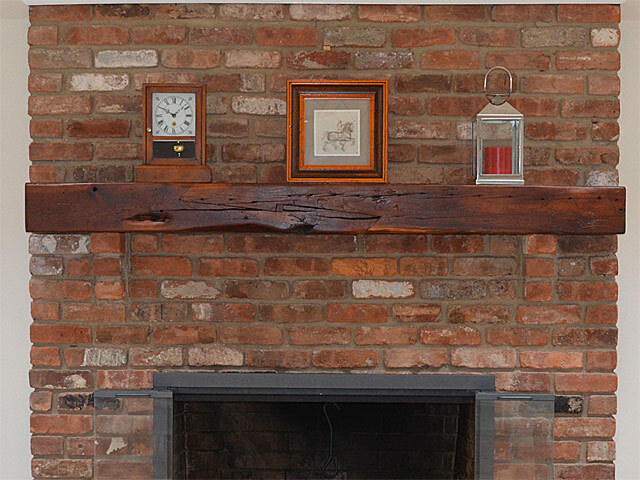 These source beams came from an 1900s – 1930s or so timber frame barn near Prior Lake, Minnesota. The mantel was sold and shipped to a customer in Connecticut. Also take a look at Mantels with Metal, Mantel Beams for Sale, Mantel Shelves for Sale, and Customer Photos.